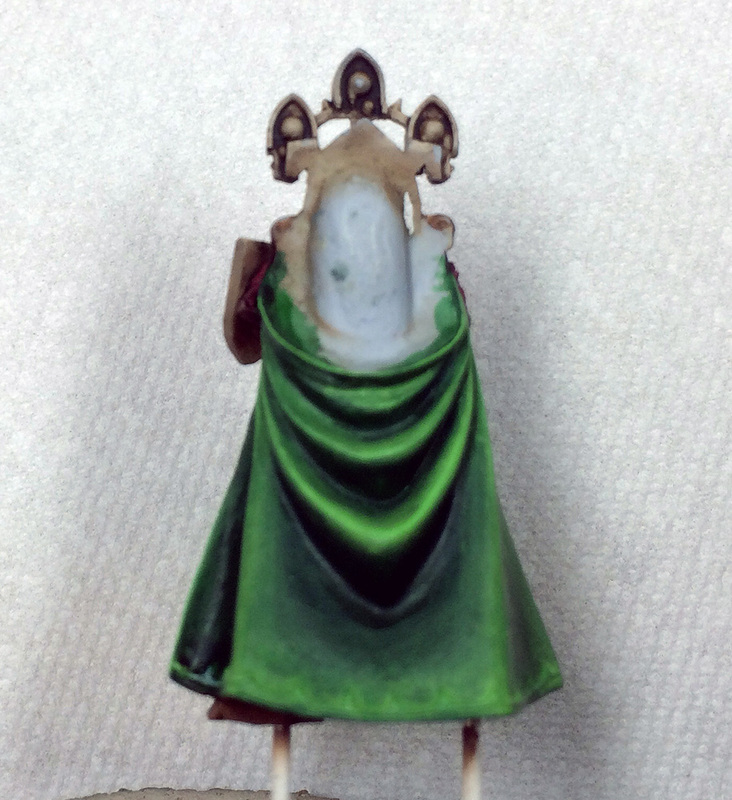 Normally in miniature painting we strive for good coverage from opaque paints. The color of the paint on the palette is the color that we wish to achieve on the model. In contrast, when glazing we purposely try to make the paints translucent. This translucency allows the paint that we are applying to interact with the paint currently on the model. In essence, we are modifying the current color rather than covering it. When layering in the above scenario, we would likely paint the area bright green. 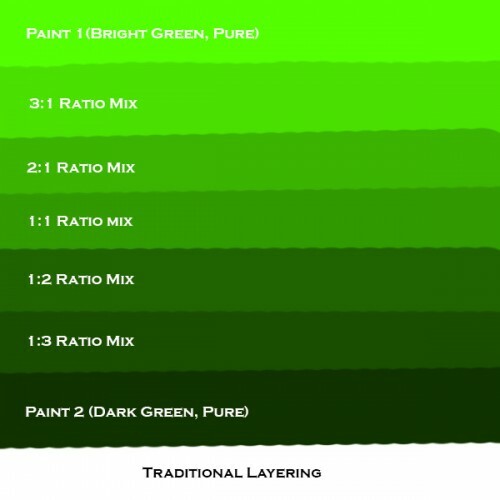 Then, on the palette, we would mix bright green with a small amount of dark green and apply it. Each additional layer would consist of more dark green until the mix no longer had much bright green left. 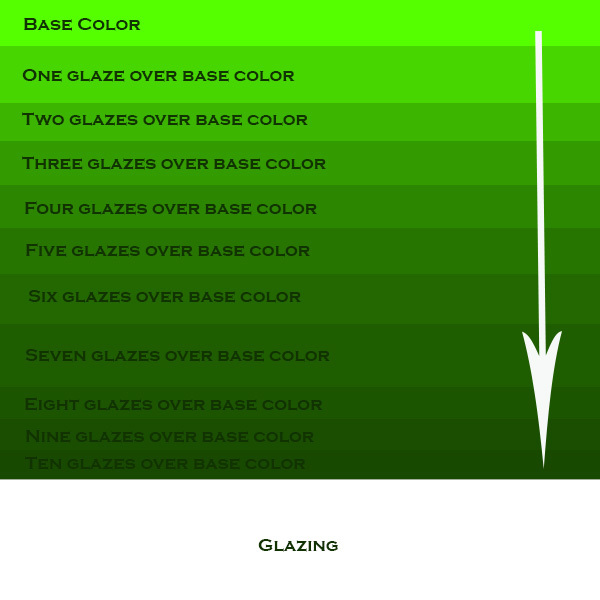 In contrast, glazing involves painting the whole area the base color, followed by successive glazes. Dark green would be thinned down and applied everywhere but the area that you wished to remain pure bright green. The second glaze would cover slightly less than the first. Progressive glazes would each be added in regions that needed to be darker and darker (or lighter depending on the color), each one not completely covering the last. When enough glazes are built up to become opaque, the paint will then be the glaze color. Note that only two colors are used, but a gradient is created much like the mixing method used in layering. The most necessary element of glazing is translucent paint. While some companies like Vallejo and Minitaire offer ready-made paints like this, it isn’t necessary to purchase them. Instead, thinning can be done with two things: water and acrylic medium. Water is the obvious and cheap choice. Unfortunately, when acrylic paint is thinned appreciably, the binders in it become too weak to do their job. What this means is that the paint will begin to act like water rather than paint and will be difficult to control. The pigment can also become unevenly distributed in the mix, further leading to unpredictability. The other choice is an acrylic medium. These go by many other names, such as glaze medium, gloss, medium, etc. Although some have added properties (gloss medium makes the paint more shiny for instance), they are all very similar. These mediums are essentially paint with no pigment. When you add this to paint, the mix still behaves like paint, but with less coverage. It should be noted that most acrylic mediums also tend to slightly decrease surface tension and increase dry time, both of which can be a benefit or a drawback depending on application. Also, while water is basically free, medium costs a little bit of money. These two additives can both be added in whatever ratio you desire until you get the behavior that you desire from the mix. Some extremely talented painters use nothing but water, but I find using mostly medium makes the process more manageable. I may change my mind as I get more experienced. Additionally, a good brush is really helpful. More so than many other techniques, the brushes behavior releasing and drawing paint will be even more critical. A good watercolor brush like a kolinsky sable will often be the best choice. When using the additive, you have to decide how thin you wish to make the mix. The more that the mix is thinned the more gradual your blend can be. consequently, each thin glaze will also do less and less to change the color, and therefore the process takes longer. Very thin mixes can also be confusing because it can be difficult to discern where you have put paint and where you have to add paint. As an example, here is my latest project for the 2014 HPC. I start with a nice even coat of VGC Dark Green on the entire cape, which is surprisingly important. Even though much of it will be covered, the translucency of the glazes mean that an uneven base coat will plague you in later steps. Next, I make a glaze out of VGC Sick Green. One the hardest parts about glazing is learning how to apply the glaze. First, load the brush, then empty most of the paint out onto a paper towel. When you place the brush onto the model, you don’t want a puddle forming or to be mopping around the glaze. 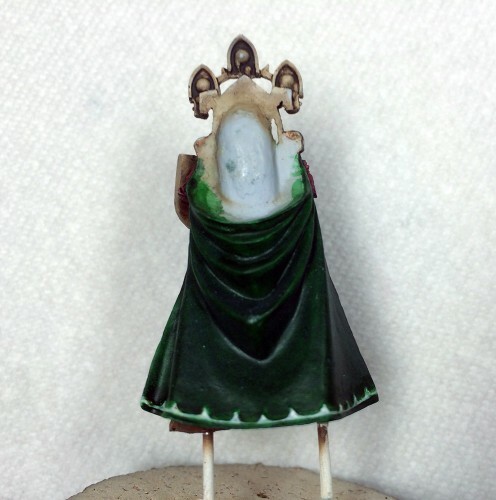 Instead, with the brush just moistened, you put just enough paint on the model to see the sheen of wetness. It also helps to brush into the direction of the color buildup. As you lift the brush off of the model, the brush will tend to leave a bit more paint where it last touched the model, so it’s best to use this to your advantage. As stated earlier, start with a wide pattern and as you build glazes add subsequent glazes to a more narrow region. In the above example, the first glaze covered all but the areas I wanted to remain very dark. Further steps covered less until the last glaze was mostly near the peaks. The image above highlights a few of these regions, with red being an example of a first glaze, orange being an intermediate glaze, and yellow being a final glaze of this color. On a related note, make absolutely sure that the prior glaze is dry before applying the next one. 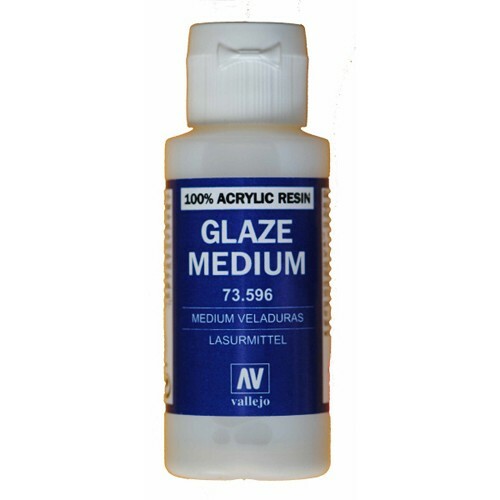 Vallejo Glaze Medium actually acts as a mild retarder, so if you use a high ratio of it in your mix expect it to take a bit longer. I highly recommend using a hair dryer to speed the process, just make sure that the heat isn’t set too high and that the air isn’t disrupting the paint. Failing to wait long enough can result in a big mess and is quite hard to fix, but if you use thin layers and don’t have puddles it shouldn’t take too long. Unfortunately, sometimes it takes a few different colors to get a smooth blend. If I proceeded straight to this color, VGC Escorpena Green, the blend would have looked grainy. Therefore, if the jump is too big, use a transition color. These glazes further focused on the highest areas and mostly covered areas that were already fully covered by the last color. 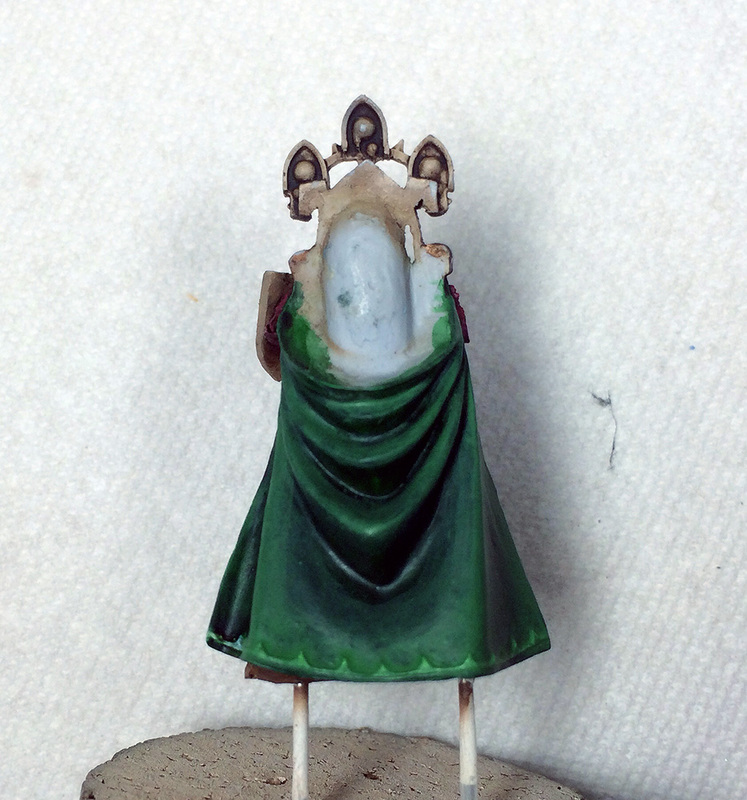 Here I showed glazing used for highlights, but it can be equally useful for shading too. That covers the basics of glazing for blending. In part 2 I’ll cover a few of the other things that can be done with glazing. 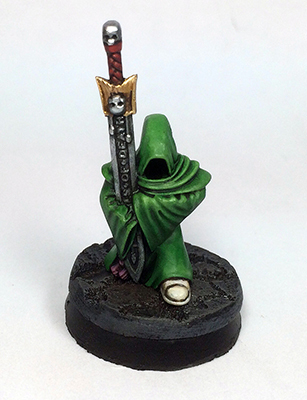 This entry was posted in Display, Painting and tagged painting, Tutorial by Erik Kenneally. Bookmark the permalink. Nicely written article, thanks for taking the time to do it, i definetly picked up a few things. I´m relatively new to glazing and i´m starting to get smooth transitions, but sometimes i get theese small dots of paint on the area im working on, and its a pain to try and get rid of, im guessing it happens wheni have too much paint on the brush? That would be my first guess. Aside from being difficult to control, too much paint on the brush often leads to spots or tide marks. If the spots are really tiny (grainy), then it could be a paint to medium issue. It takes very little paint on the brush to glaze. You might also try using a different brush size as they have different loading/unloading feels and find one that you prefer. What’s your ratio medium to paint when you make your glaze? Amazing! I have been wanting to take my painting to the next level but didn’t know where to start. I’ve been watching Vince Ventrella on his hobby cheating as I love his work but couldn’t figure out the method of glazing so I can’t thank you enough. My minis will thank you too ….I hope.